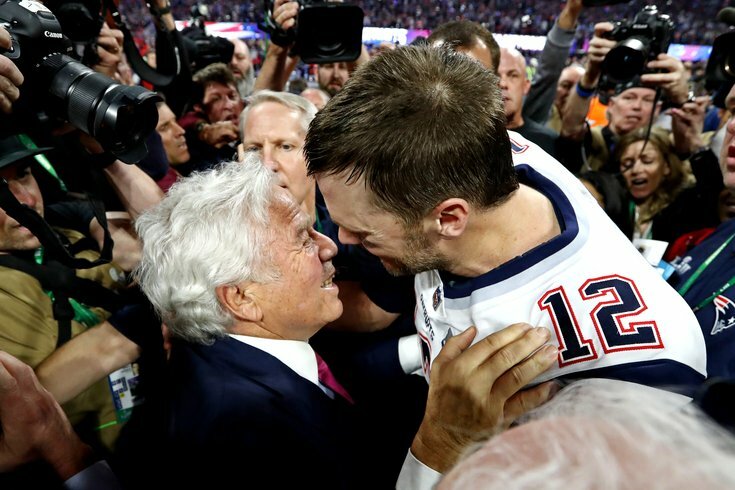 Tom Brady and Patriots owner Robert Kraft embrace after Super Bowl LIII. The New England Patriots are not the only ones with cause for celebration today after their 13-3 win over the Los Angeles Rams in Super Bowl 53. The Eagles need to take a bow, too. They were also big winners last night in Atlanta. How so? It’s very simple, really. Just look at all the stories strewn across the Internet right now, odes to the brilliance of coach Bill Belichick, the resilience of Tom Brady, the omnipotence of the mighty Patriots. In just about every way imaginable, the victory by New England proved how special the Eagles’ upset was last year. Let’s start with the overall play. The Eagles scored 41 points against basically the same defense that allowed three to the Rams. Quarterback Nick Foles led his offense to 538 yards last year; a terrified Jared Goff managed only 260 on Sunday. The Birds stopped Brady in the final minutes to win the game. With everything on the line last night, the Rams drowned in their own flop-sweat. The bottom line is, Super Bowl 52 was a spectacular sports event. Super Bowl 53 was a dog with fleas. How bad was the game last night? There were 14 punts, compared to one in the Eagles-Pats contest. Top Atlanta sports talker John Kincade called the contest “a steaming pile of dung” on my WIP radio show this morning. And the absolute best part of the outcome, from an Eagles perspective, is that coach Sean McVay, the 33-year-old wunderkind who beat Eagles coach Doug Pederson for coach-of-the-year honors last season, got crushed under the weight of the Bill Belichick legend. Unlike Pederson’s performance a year ago, McVay coached timidly, wary of a man who had already won five Super Bowls and had appeared in nine of the past 18. McVay is supposed to be a shining example of offensive innovation, while Pederson is merely a cheap rip-off of Andy Reid. Ha, ha. Somebody ought to show McVay a tape of the Philly Special. After the game, McVay admitted: “I was outcoached.” Pederson didn’t have to utter those words a year ago. In fact, it would have been nice if Belichick said them, since they were true. Pederson was better than Belichick last year. McVay got owned by the same coach last night. Is it too late to have a revote on the 2018 coach of the year? Let’s be totally candid about Super Bowl 53. It was a hideous night for the NFL and for the Rams. There was a gambling controversy because Gladys Knight dragged the final “home of the brave” out so long, bettors who had the over scored a narrow victory. Some sports books paid off on both sides. There were no such issues with Pink’s beautiful national anthem in SB52. The halftime shows were no match, either. Maroon 5, a lousy band to begin with, invited rapper Travis Scott onto the stage to spout a stream of horrific profanities, and then lead singer Adam Levine doffed his shirt, in a final act of desperation. Justin Timberlake didn’t need to remove his clothes last year. He has actual talent. From what I heard – I had no stomach to watch the evil Patriots celebrate – even the post-game celebration paled in comparison. Spoilsport Tom Brady accepted Goff’s handshake, unlike Brady’s snub of Foles last year. Then Brady dodged a postgame interview for three minutes, and finally he appeared to kiss New England owner Robert Kraft on the mouth. Yuck. As you might imagine, TV ratings were down substantially from 2018, both because the game was awful and because there was no Cinderella this time. The NFL missed the Eagles – badly – in Super Bowl 53. America did, too. So take one more bow, Philadelphia. At Super Bowl 53, the Eagles won in absentia. On the biggest stage in sports, their presence was sorely missed. No one puts on a show like our beloved football team. Next year, if the NFL and America are lucky, the Eagles will be back where they belong, playing in Super Bowl 54.